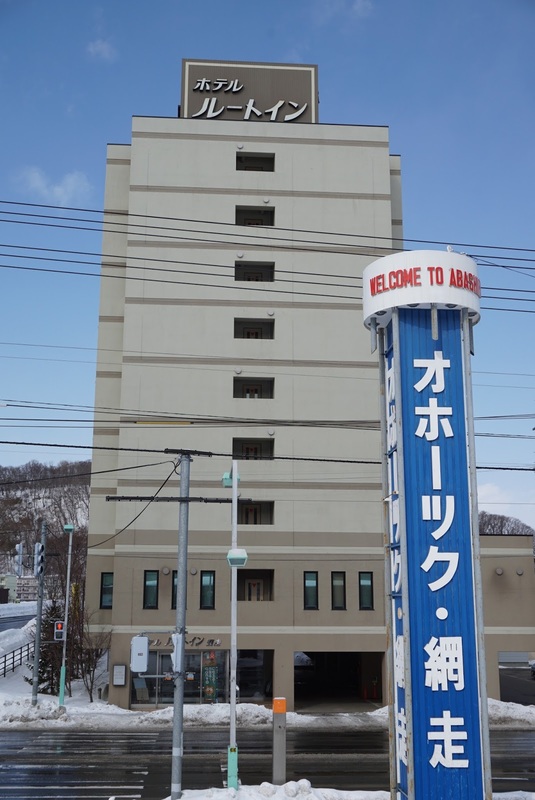 Hotel Route-Inn Abashiri Ekimae is located directly across Abashiri JR Station, where most of visitors coming to Abashiri will step through. 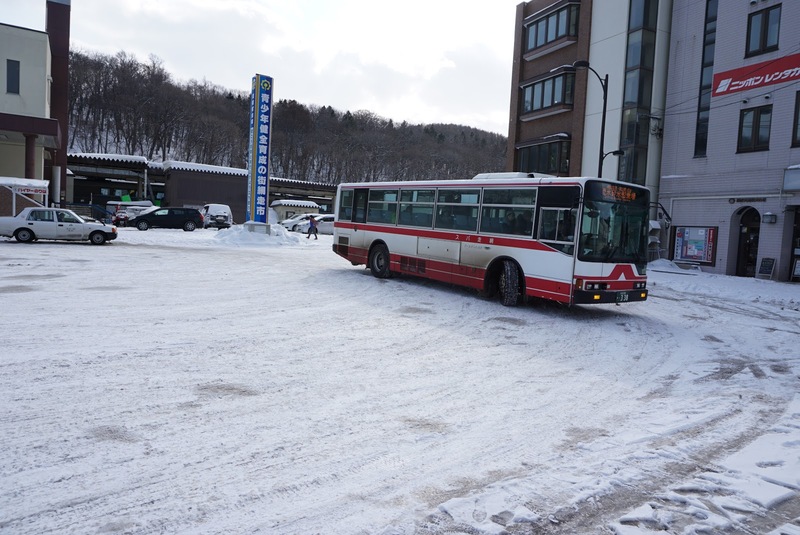 There are bus stops around that brings visitors to the major sights in Abashiri. 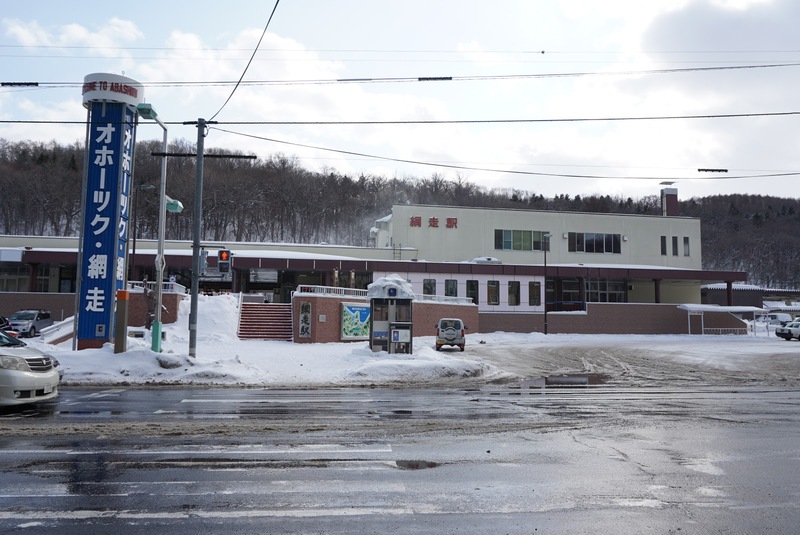 The hotel is within 15 mins from Abashiri city centre by foot and 5 mins by bus to the Ice-breaker cruise terminal. There are some food options around the hotel and one of them operates 24 hours. There is also a 24-hour convenient shop opposite the hotel. 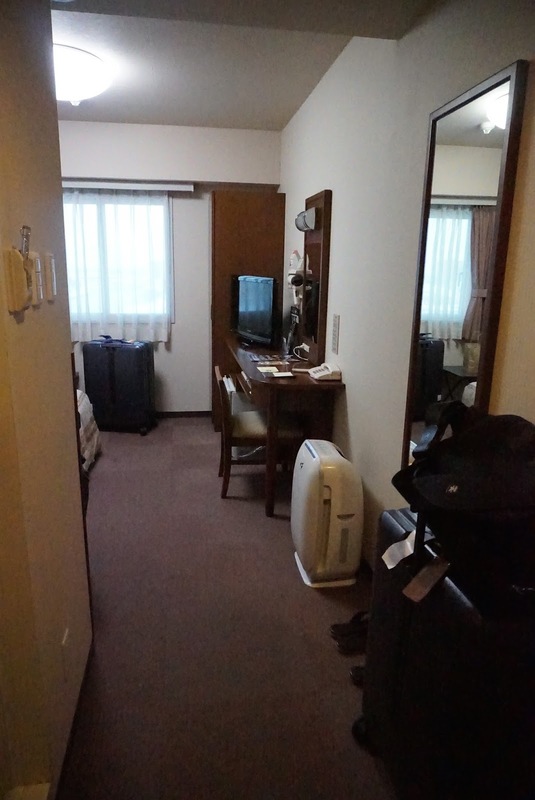 The double room I checked into Hotel Route-Inn Abashiri Ekimae is very small, measuring 12㎡. Entering the room a small passageway with the bathroom on the left, leads into the room. The room is very simply furnished. A double bed placed by the wall to the left, facing a 2-panel window, took up most of the space in the room. 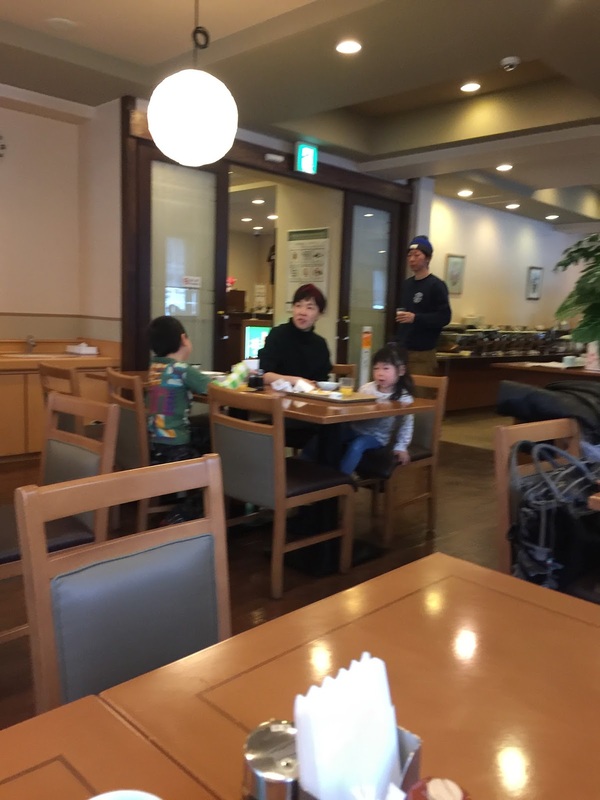 There is a small table placed by the window. Along the wall on the right side of the room placed a small dressing table with a mirror hung on the wall. This 2-tiered table has a lot of stuff placed on it. 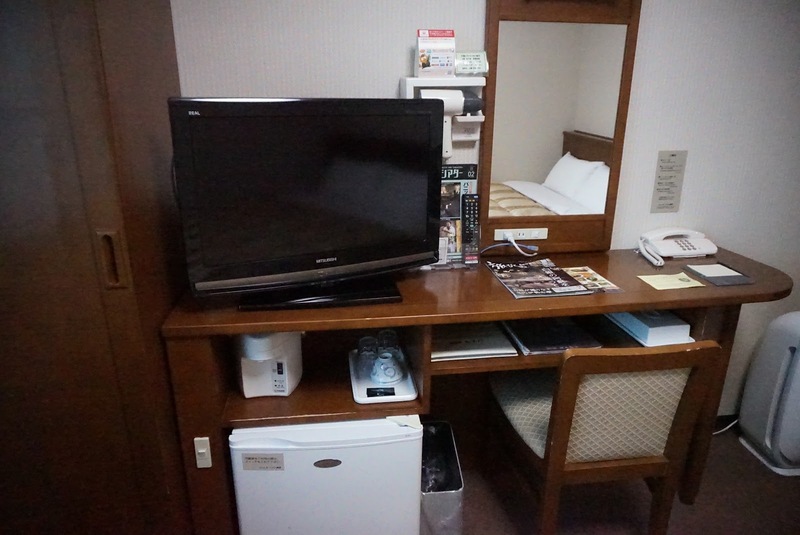 The in-room telephone and a small TV is placed on this table together with some brochures on Abashiri City. There is a vending machine in front of the lift on the level our room was assigned selling pay-per-view outdated Hollywood movies. There is a hairdryer mounted on the wall, between the TV and the mirror. Electric kettle and tea are placed on the lower tier of this table. At the end of the table, placed on the floor is a small mini fridge. A small wardrobe, which can only fit 2 large winter jackets, is found sitting in the corner after the table. 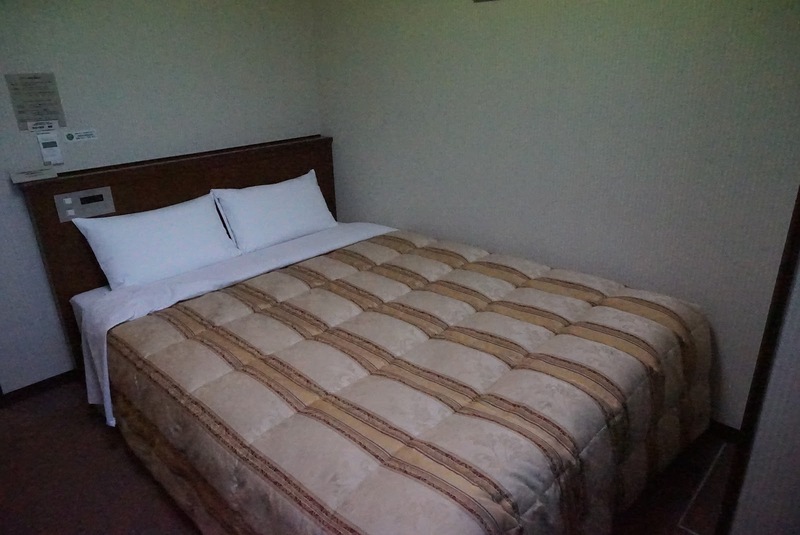 There are not much space for us to stow our 28″ luggage, we had to shift the small table beside the bed to make space. 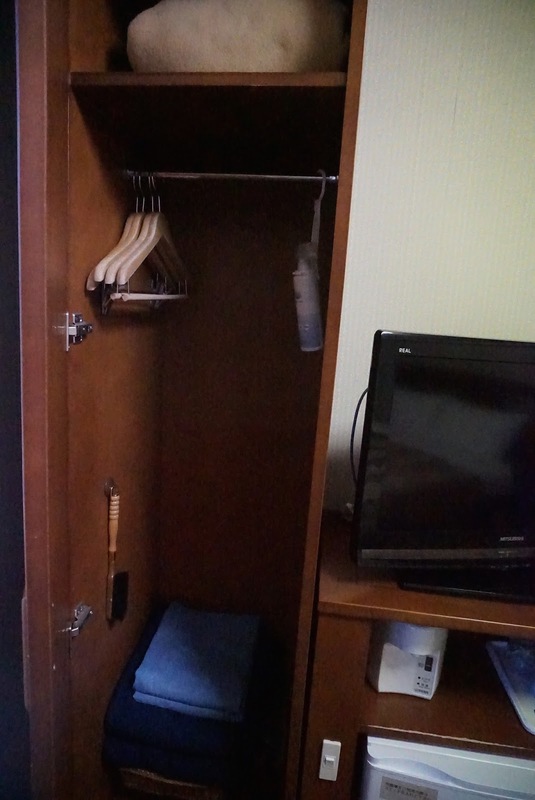 There are no in-room safe in the double room. The bathroom in Hotel Route-Inn Abashiri Ekimae is very small. The toilet bowl with washlet function is located right at the entrance to the bathroom, with sink beside it. Further into the small bathroom is a bathtub where one would have shower in. The tap and the shower head shares the same pipe, one would need to flip the switch in order for water to flow out of the shower head or the tap. There isn’t much space for one to put much toiletries. 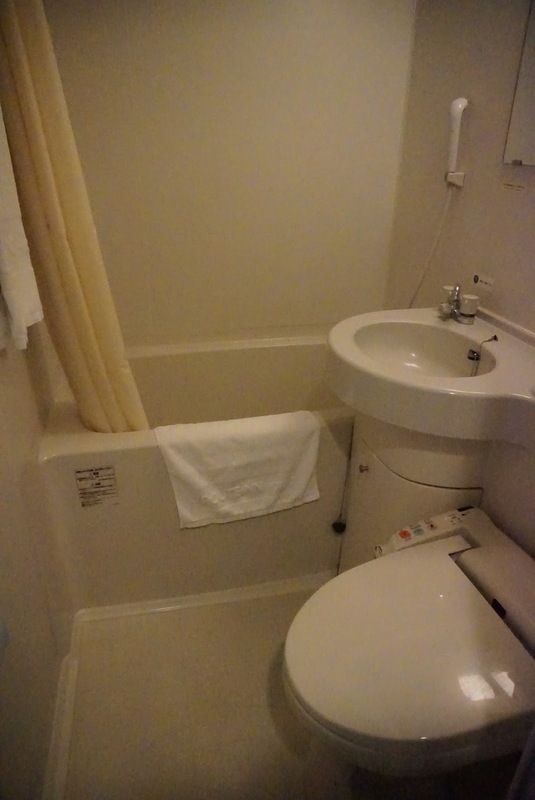 Despite the small bathroom space, Hotel Route-Inn Abashiri Ekimae provides the essential bathing amenities. The rate I booked includes breakfast in the hotel. The restaurant that serves breakfast is very small. As we arrived at the restaurant 30 mins to the end of breakfast service on the first day, my friend and I had a hard time looking for an empty table and had to eat whatever was leftover as the food was not replenished perhaps due to nearing the end of breakfast service. On the second day, we arrived early and had no problems looking for seats. My advise is to arrive the restaurant for breakfast early. The food was mediocre and the selection is limited. 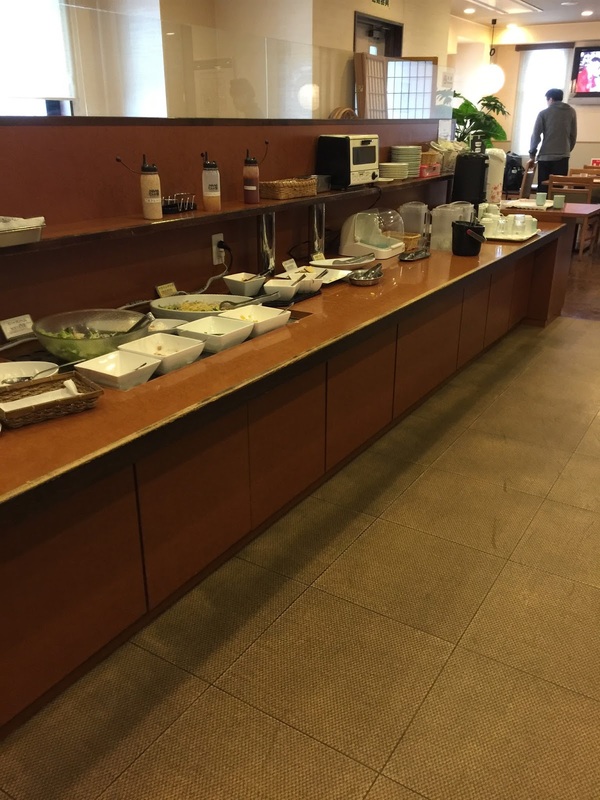 Most of the food served are Japanese cuisine and the only western food are the assorted bread and some salads but it does the job of filling my stomach. 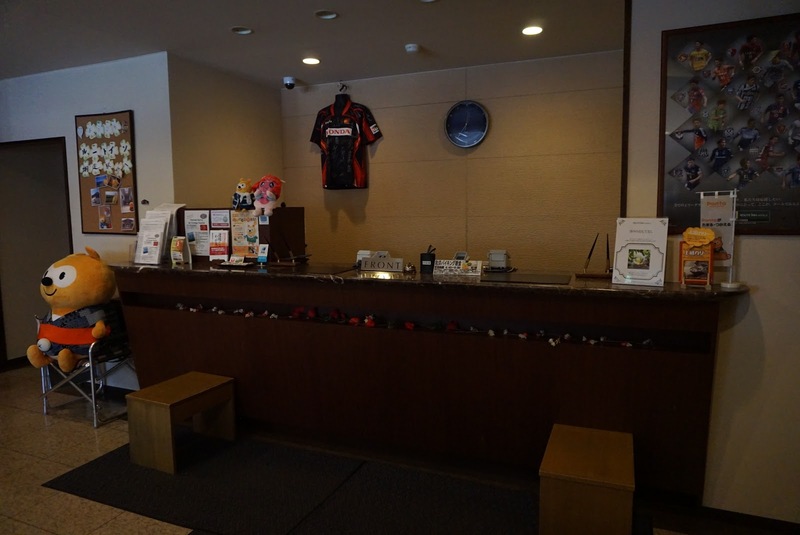 There are very limited facilities in Hotel Route-Inn Abashiri Ekimae. As the rooms in the hotel are non-smoking, the only place to smoke in the hotel is in the smoking room on the 2nd floor, where the reception is located. 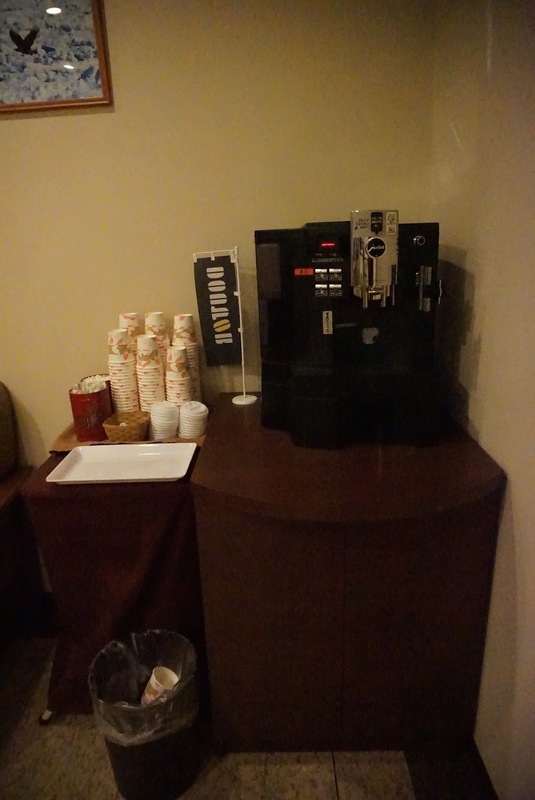 There is a coffee machine in the hotel lobby, providing complementary coffee to hotel guests. The public bath is located on 2nd floor as well, past the reception. Due to the small public bath (can take up to 6 person at any one time), I did not use the public bath here. There are laundary facilities in the hotel, located outside the public bath. Service is a mix at the hotel but still acceptable. Generally the staff at the reception are welcoming. As I arrived in the hotel 2 hours earlier than the check-in timing. I was not allowed to check-in and was told to come back at the check-in timing. However the staff took the initiative to suggest some sights I can visit in Abashiri and provided me with some brochures. The staff offered to take care our luggage. We were greeted with a smile at times when we walk past the reception. Checking-in was done efficiently, however we were required to pay the room charges at the time of check-in. Check-out is a breeze at the hotel. There are hardly any staff at the restaurant, except for one who appears to be coordinating the food and another busy replenishing the food. Empty plates were not cleared and guests are expected to place their empty plates in a trolley in the restaurant. The housekeeping staffs were very friendly and greeted us on occasions we past by them. These industrious staffs kept our room clean and tidy. The reception was not manned at the time of our arrival at the hotel. 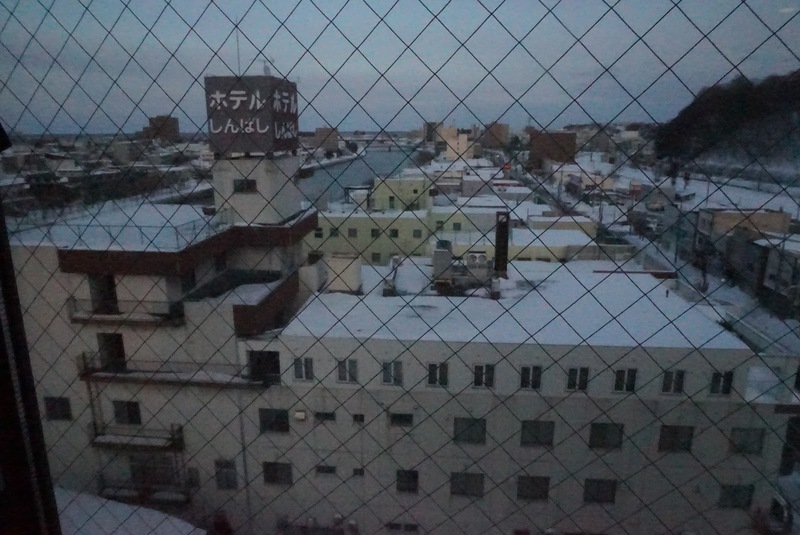 Hotel Route-Inn Abashiri Ekimae is a business hotel and does the job of providing guests with a place to rest at night. The room I checked into is very small, but functional. Sleep quality in the hotel is decent. The service is a mix in the hotel, with the friendliest staff found in the reception. 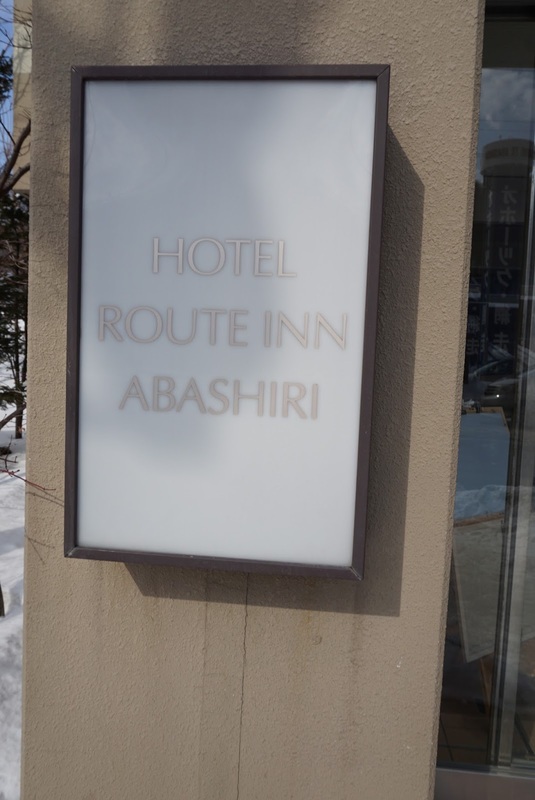 Having said that, Hotel Route-Inn Abashiri Ekimae is one of the better hotels in Abashiri City that is close to Abashiri JR Station.